This Friday, April 6th, at The Red Clover Inn & Restaurant will be the April Wine Dinner, featuring Spanish wines. First, a celebratory start with fresh, crisp Cava bubbles, carrying on to a vibrant Albarino, and moving into the more hearty classics of Rioja and Tempranillo. Chef Dennis Vieira will pair wines with traditional Spanish cuisine with his own unique twist using pork, seafood and lamb. Space is limited for this event, so call 800-752-0571 to make your reservation today! 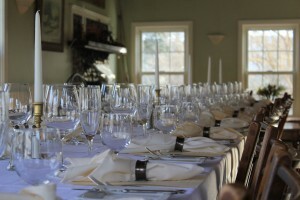 There is a new wine dinner event each month, so be sure to check the schedule of Red Clover Inn’s wine events. Want to spend the weekend? There are wine event packages that include overnight stays and weekend getaways.